I’ve been admiring the shorts that Pam from Threading my Way has been making for such a long time (see link here which then links to her many versions!). So when I was looking for a new pattern, I took a look a closer look these. 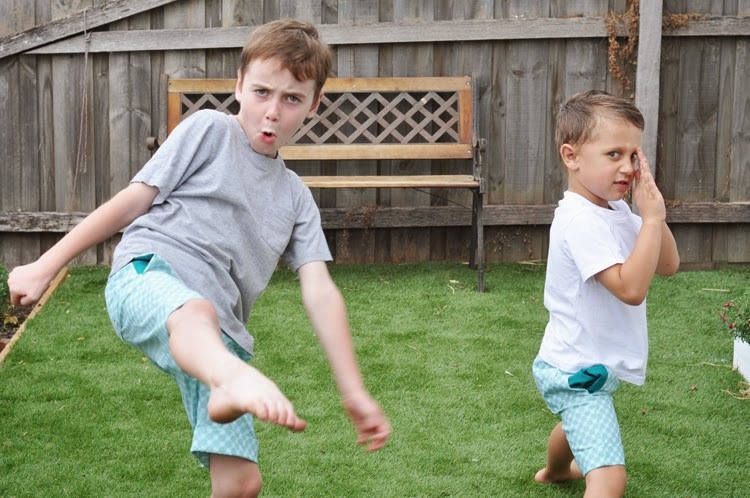 Shorts and pants in one pattern, sizes 12 months to 12 years – winner! For this version I added a contrasting solid green for the side seam pockets. There are quite a few options for you to personalise your shorts or pants with this pattern. Firstly you can make either shorts or pants, add side pockets, add a back pocket, add faux fly details and include cuffs. I love the slimmer fit of these shorts compared to others I have tried. Adding the cuffs means you can drop them down as they grow and add a little length. My minis just seem to get taller rather than wider. I love these denim version! I will admit the first time I made the shorts, I might have sewn the pockets on the wrong end. It is worth keeping your pattern attached to the fabric or pinning a size label at the top so you don’t get them mixed up. It is more obvious on the larger sizes but on the little ones, the top and bottom are virtually the same! I had Master 7’s help in designing the pants. I wasn’t sure if I would be adding them to the Lil Pip range (and at this stage I won’t be) so I wanted to make something just for him. He chose the cord fabric and the red stripe from my stash. I’m so pleased that months after I made these they are in regular rotation in his wardrobe. An achievement with an almost 8 year old boy. 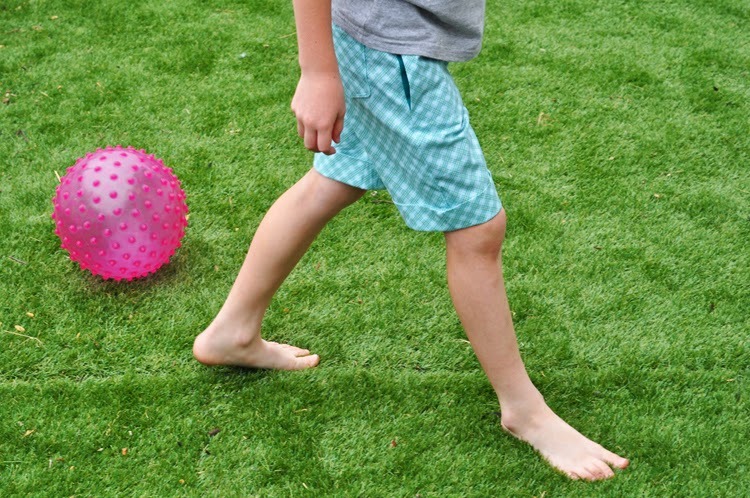 These shorts are a comfortable fit (or so I’m told), allowing for what boys do best – extreme playing at the same time as extra details that make these a little more special. I love the little peek of the orange pocket there. 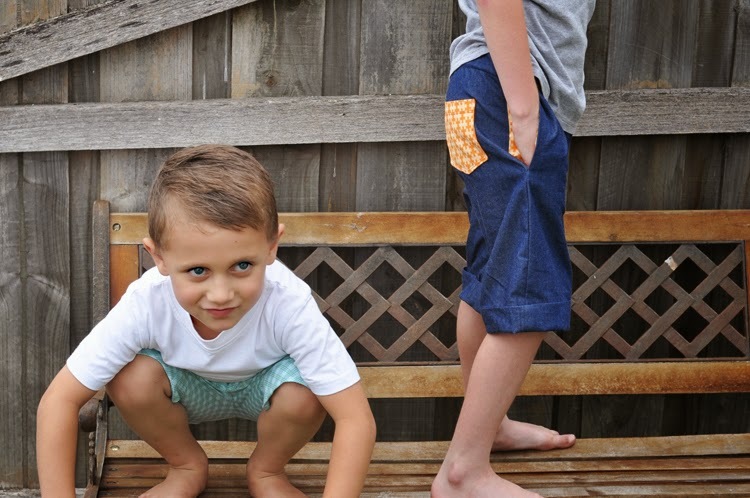 Fabric: Shorts are Riley Blake Designs Hoo's in the Forest Plaid Blue by Doohikey Designs – found a little end of bolt on Etsy here but this is an old fabric so if you like it, grab it now! Pants are a cord from Spotlight and Robert Kaufman Dr Seuss Grinch Christmas Tonal Stripe Scarlet Red also from Spotlight. You can find it here on eBay or in the Fat Quarter Shop. Time: I would allow 1 – 1.5 hours to sew depending on the extra details. What happens when you get boys together for a photoshoot. Oh dear! Lovely and I really like the light blue. I'd totally forgotten that these were a pants pattern as well as shorts. A timely reminder for me now that it's Winter. I love cord and have some buried in my stash. The long pants would look good in denim, too. I love how you've used a contrasting fabric for the pockets. Thanks for the link back!